**** SOLD OUT **** Call 916-425-7177 for availability. Use your CAMERA* AND any PHOTO PROPS. 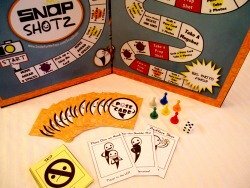 This "old school" board game meets ANY "new technology" with fun for all ages. 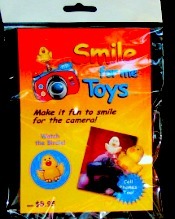 Guaranteed to get some silly and serious photos! Order inquiries Call 916-425-7177 and ask for Carl for shipping quotes. Watch our Watch The Birdie Cartoon Short(Click here.) on our HOME PAGE. Kids love watching the Birdie come to life! (Special thanks to cartoonist Emily Cesar and the voice of Anita O'Day, "Watch the birdie", music and lyrics by Don Raye and Gene De Paul). Choking Hazard. Small Parts, Not for children under 3 yrs without adult supervision. Note: We ship with minimum "frustration fee" packaging. Prices subject to change, may ship up to 4 to 6 weeks. International shipping can be arranged with prior approval.